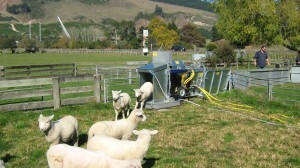 The Electrodip was developed by Des and Martin Carey in 1989 as they figured there had to be an easier way to dip sheep than in plunge or shower dips. Having a farm of their own meant they knew how time consuming the dipping process was. Over the years, Des & Martin developed the Electrodip, taking into the consideration the feedback of farmers. Manufacturing started in a small building in Te Puke with just Martin producing the Electrodip and Des selling them. The workshop has now grown to it’s existing premises in Te Puke with the Electrodip being manufactured using modern machinery and methods. Des retired from the business in 2009 but still provided some guidance in the latest developments of the Electrodip. Sadly Des passed away in 2014.